Here is a toolkit to help you get the word out! 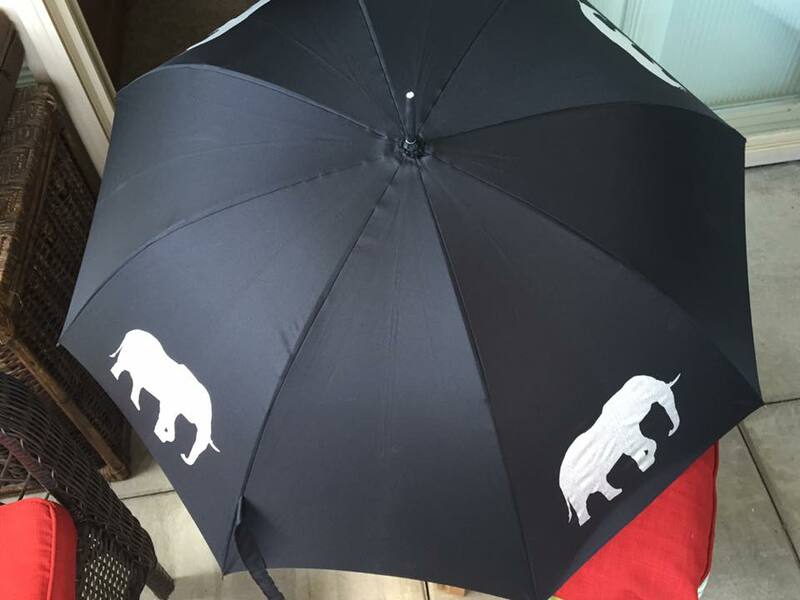 Posters, petitions, umbrellas and t-shirts are soon to come! Download – Print – Post! This year Vancouver joins 10 other Canadian cities on the weekend of October 3 & 4th. 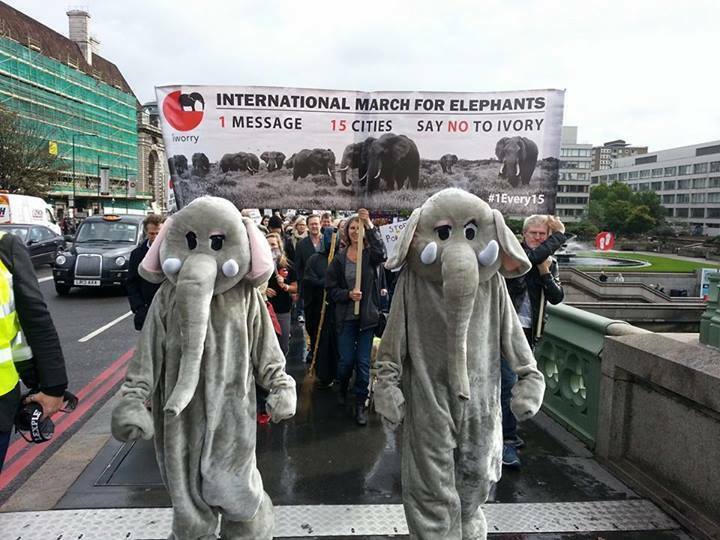 Over 120 cities around the world will also be marching to draw attention to the crisis facing these species (and others) and to call for an end to the ivory and rhino horn trade that is pushing these (and many other species) towards extinction.Our march also aims to raise awareness of the issues facing the Asian elephant. It is estimated that there are less than 30,000 remaining with many living difficult (abusive) lives in the tourist trekking and illegal logging industries. Wherever you are find a march near you. 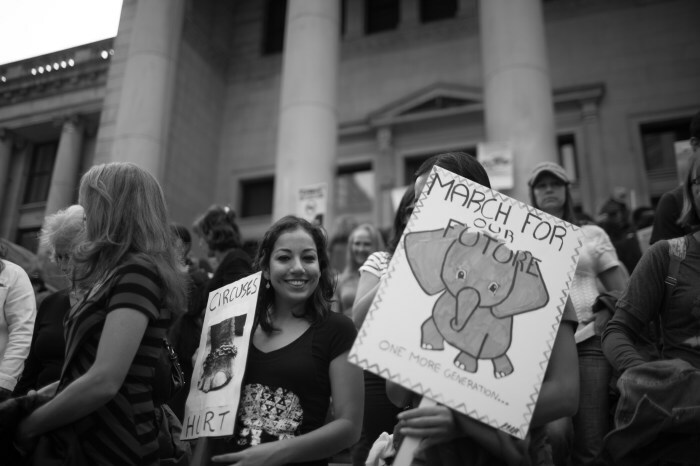 elephanatics.org is hosting this march! 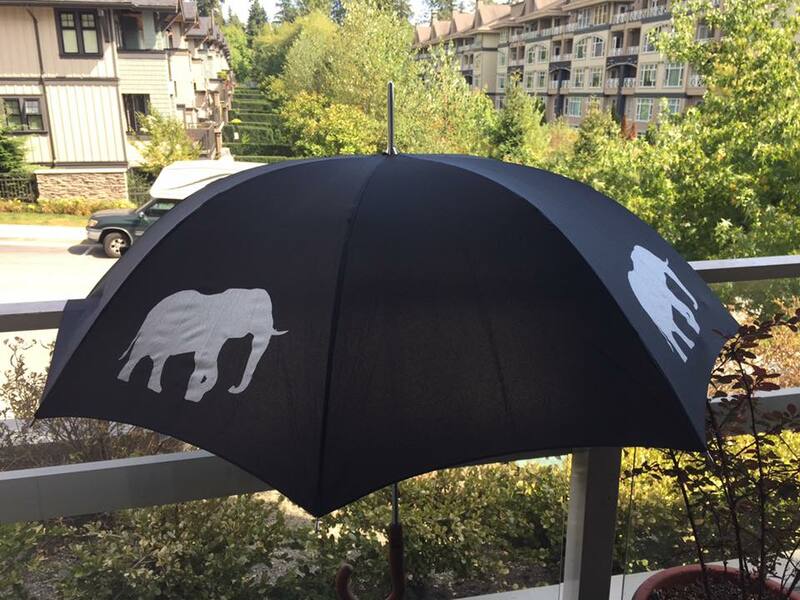 https://www.facebook.com/Elephanatics — Like us! 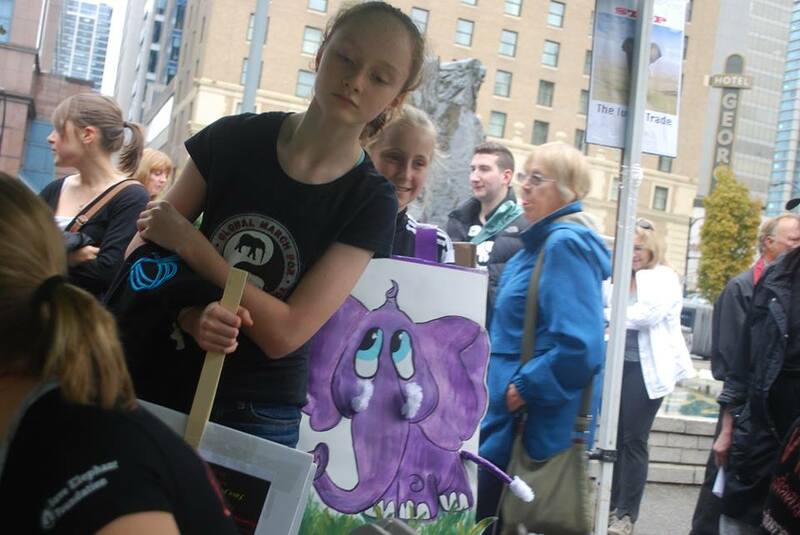 I am an animal lover and an advocate for species at risk. 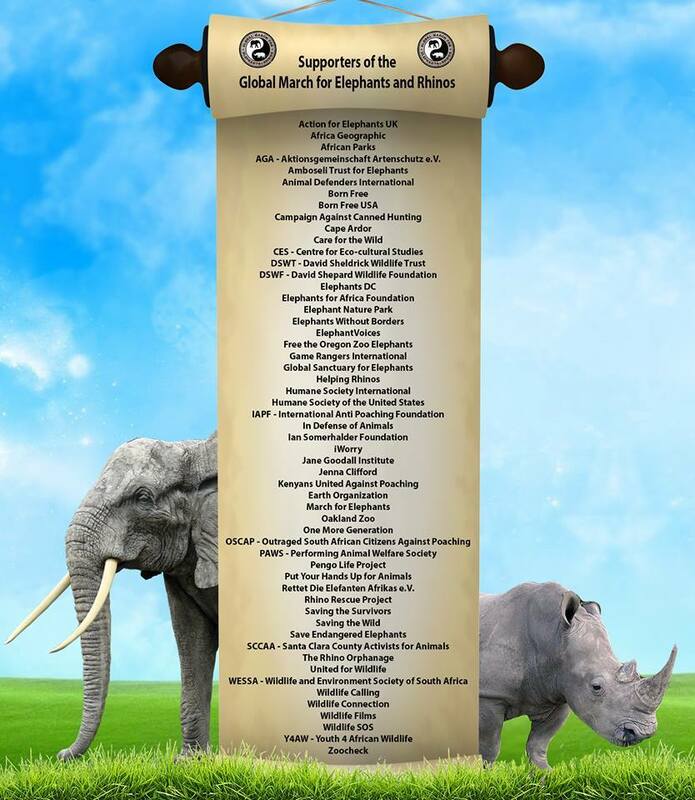 I have pledged to raise awareness and funds for elephants and rhinos. 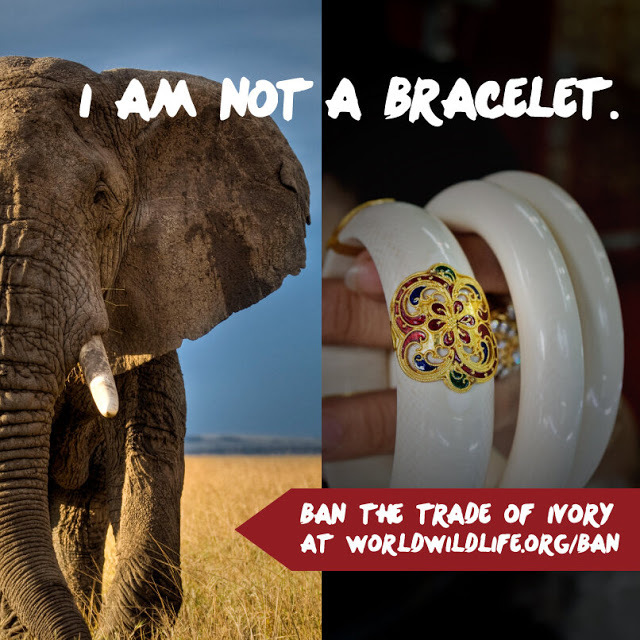 I advocate on behalf of elephants and rhinos who are poached, elephants who are enslaved in entertainment or in horrific conditions as working animals. (Asian Tourism, circus elephants). 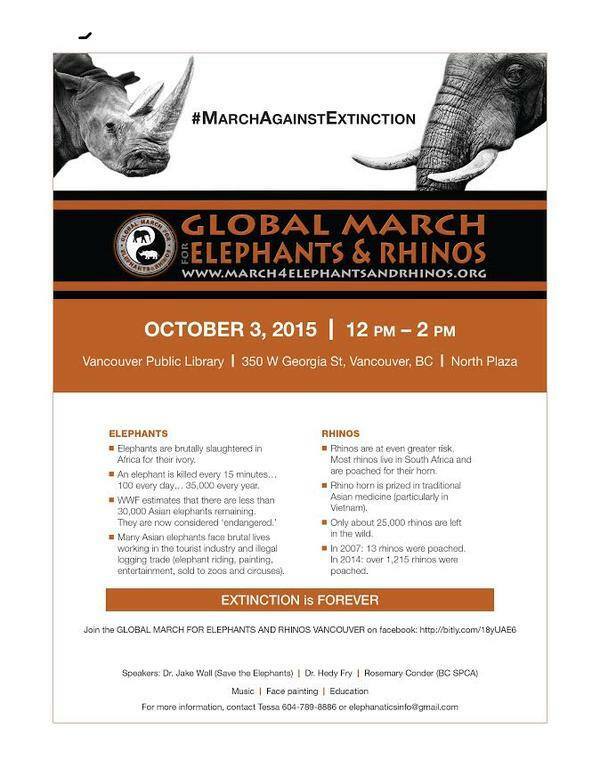 I am also the co-organizer for the second annual Global March for Elephants and Rhinos on October 3rd, 2015. 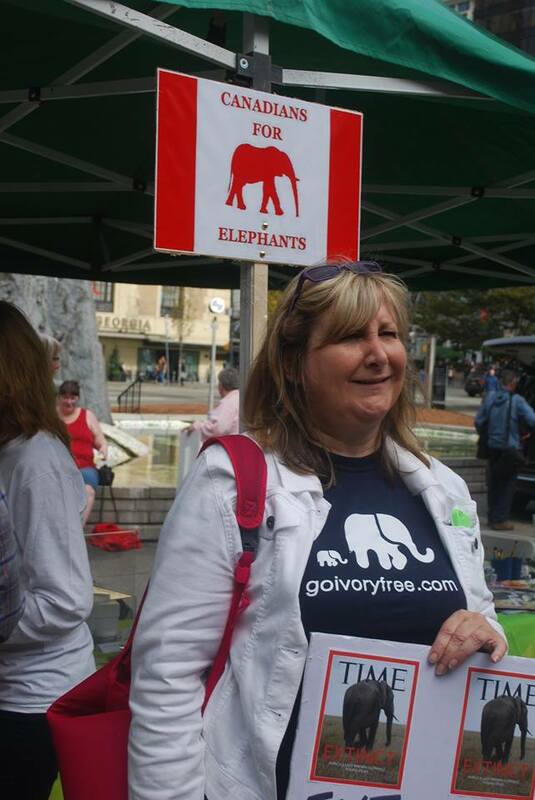 I am grateful for my co-organizers Fran, Andrea, Jake and Christine at Elephanatics who have jumped into the madness with me along with the growing number of incredible volunteers, not the least of whom is Dave who works tirelessly for animals. Please find a city near you or better yet organize a march in your city! 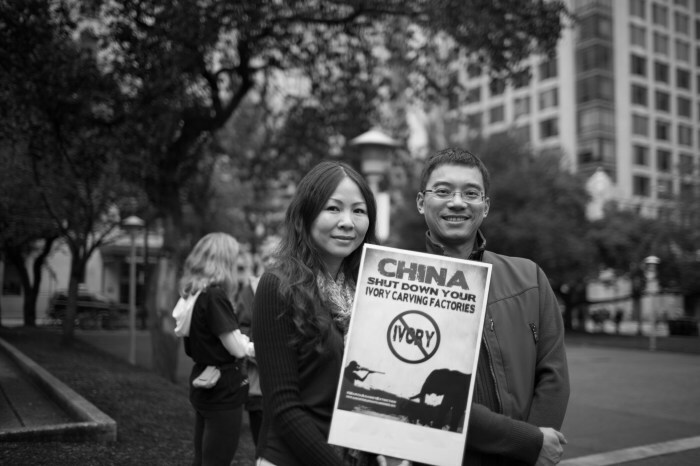 Without our help, without a global effort these two species face extinction. Last year 137 cities, and over 50,000 people marched. Let’s double it this year. Let’s scream and yell and make our voices heard. 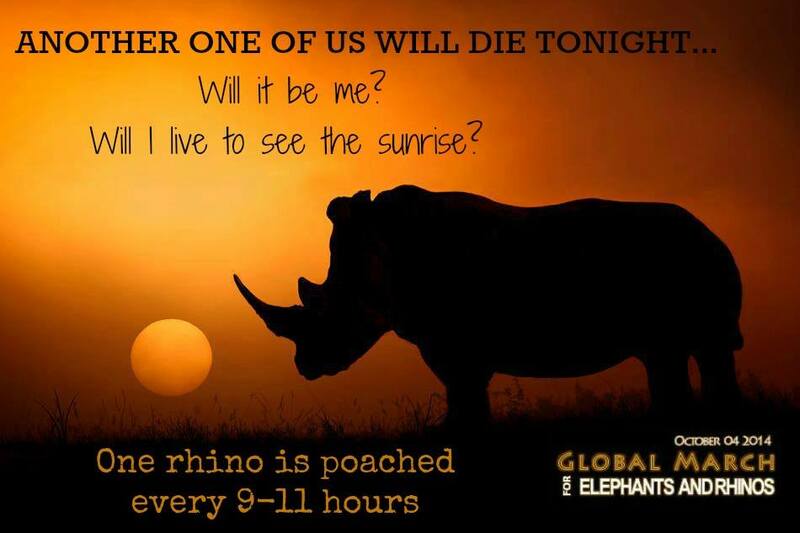 Let’s change this outcome for these animals. Come on. Let’s do it. 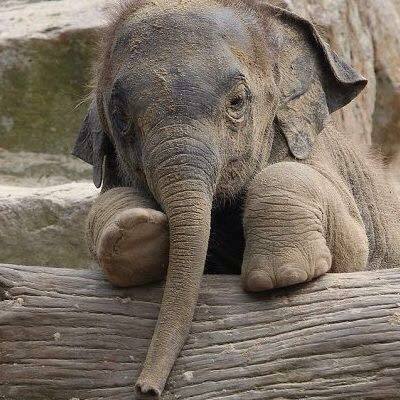 Last year 35,000 elephants were poached, 100 a day, or 1 every 15 minutes. 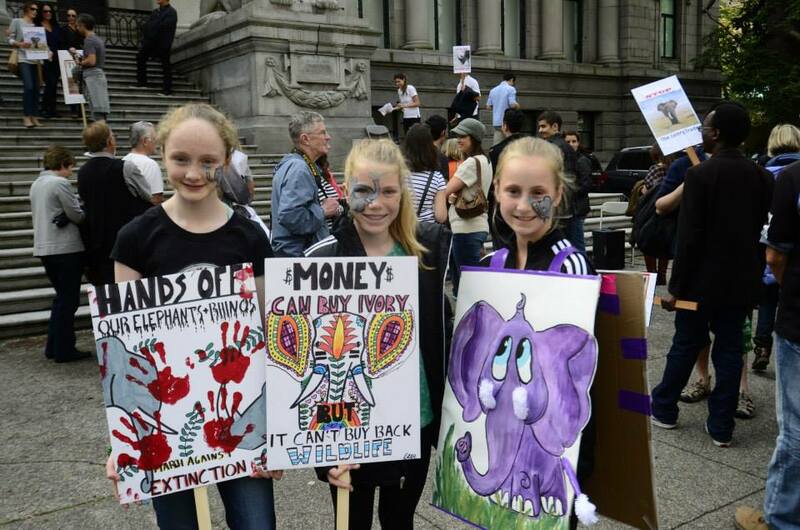 There is a growing market for ivory from China with the US being the second biggest market for ivory. 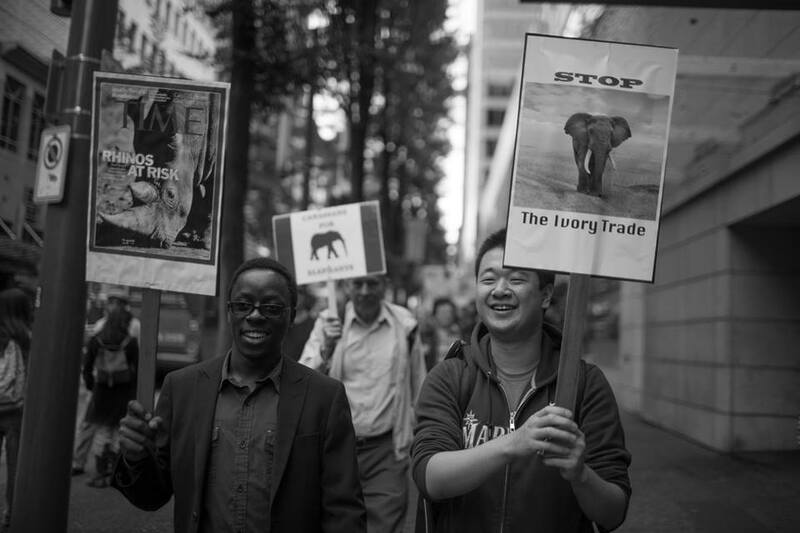 Political instability and terror groups use ivory to fund their activities. 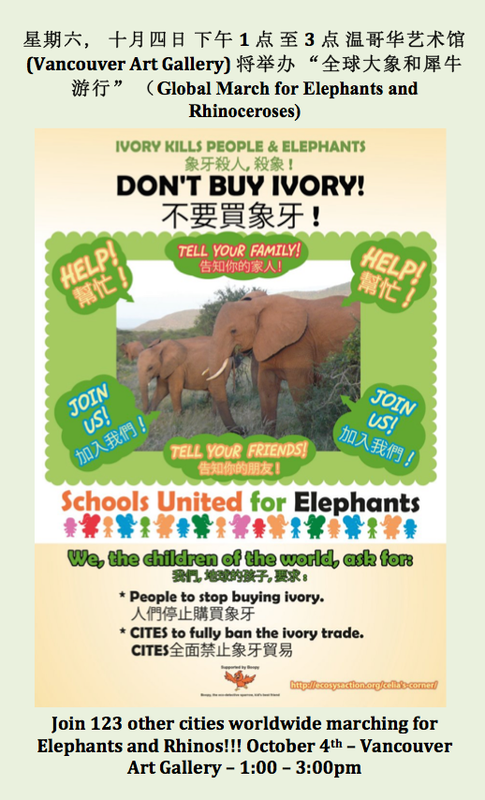 Ivory is now worth more than gold. Poaching is wreaking havoc on elephant populations and on communities. Less than 100 years ago 5 million elephants roamed Africa. 90 percent of them are now gone. On our watch. 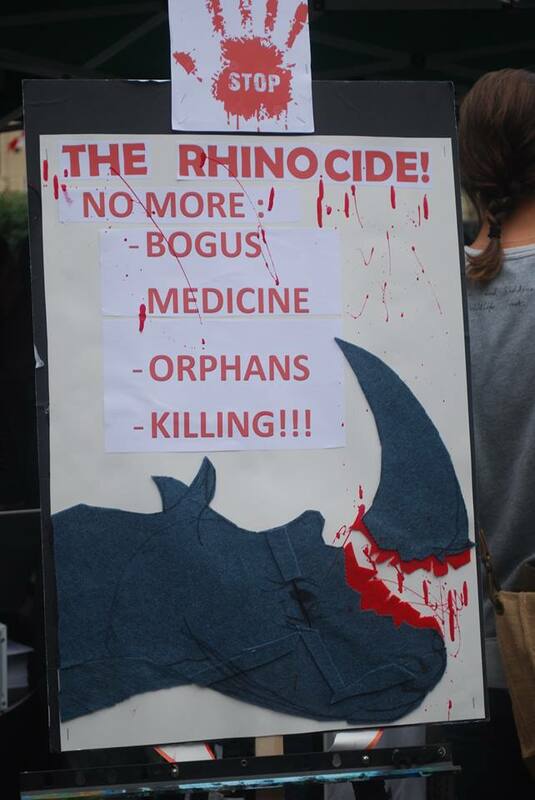 Rhino horn is prized for its “medicinal” properties. This miseducation has left us with only 25,000 rhinos and a rapidly growing market in Vietnam and Asia. 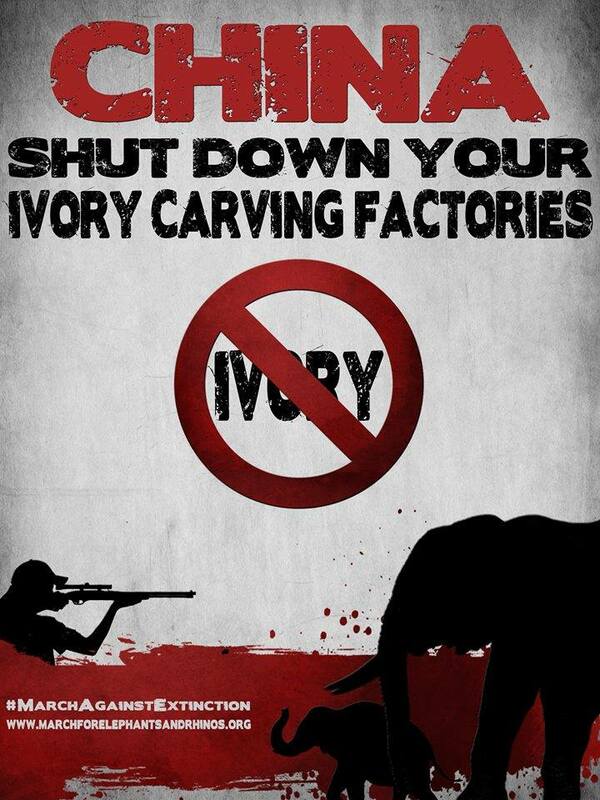 Ivory funds terrorism. 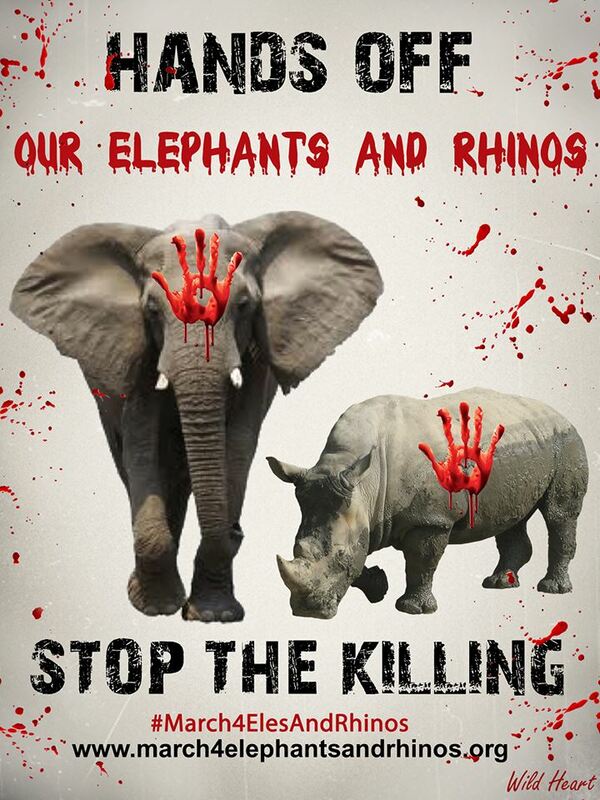 Elephants and rhinos cannot fight the war that is being waged against them without our/your help. 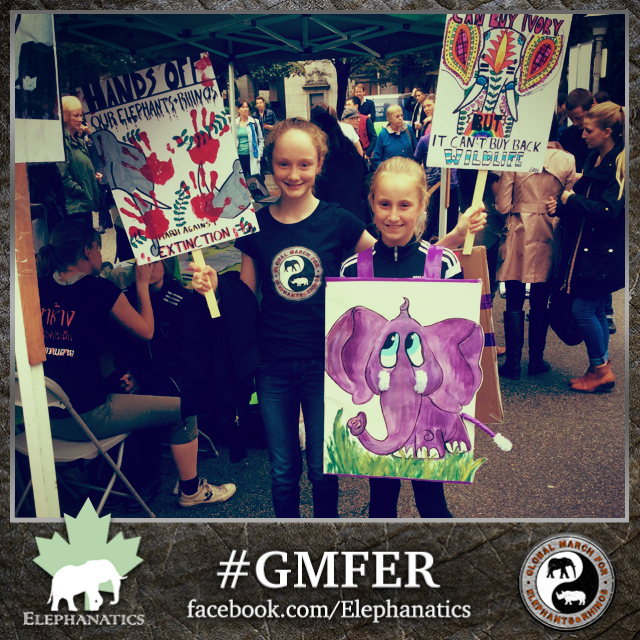 You can find out more about the Global March for Elephants and Rhinos right here. Find your city and join the many others who are lending their time and effort to speak up on their behalf. 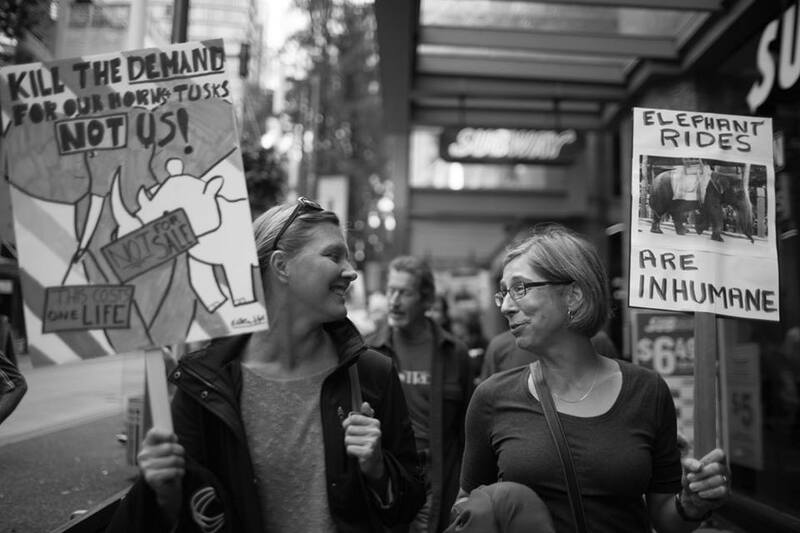 Here are some pictures from last year’s march. 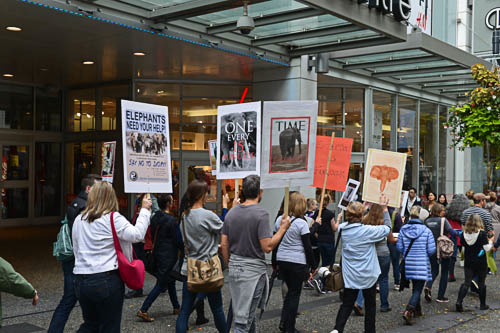 The Vancouver march will be held at the Vancouver Public Library North Plaza from 12:00 pm to 2:00 om Saturday October 3rd. Join us. These guys need all the help they can get. We’ll have music, speakers, face painters, cool stuff for sale and of course we’ll sign petitions and make as much noise as we can so the world hears and responds to this urgent issue. 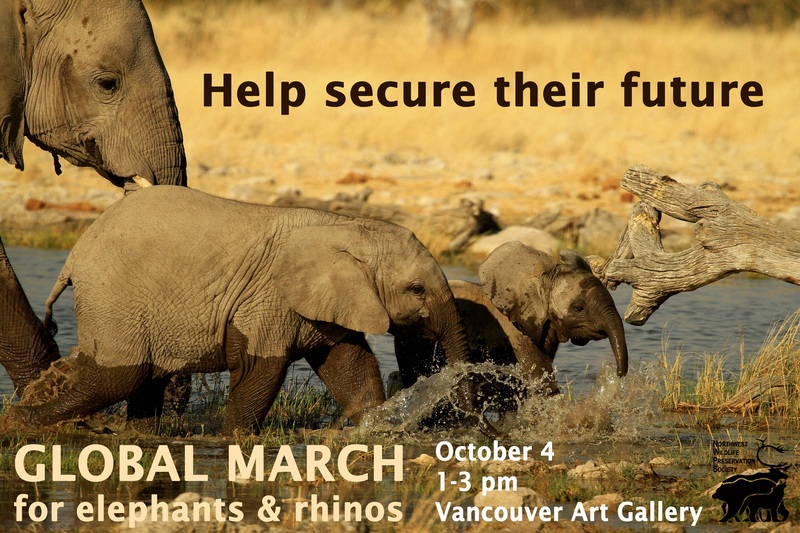 Join the Vancouver march here. 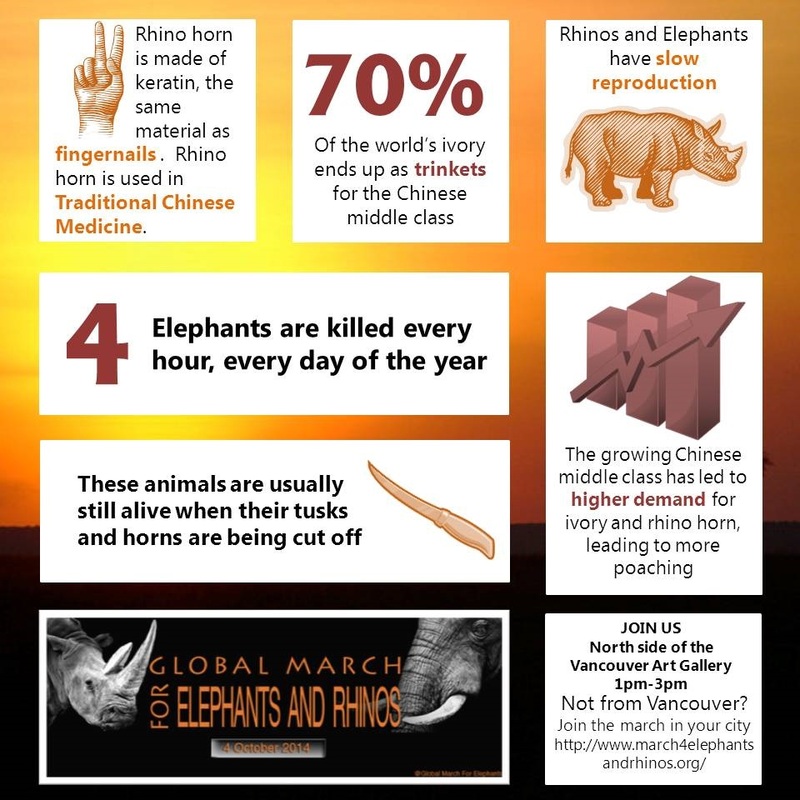 On October 4, 2014 Vancouver will be taking part in the Global March for Elephants and Rhinos to draw attention to the crisis facing these two species and to call for an end to the ivory and rhino horn trade that is pushing them rapidly towards extinction. 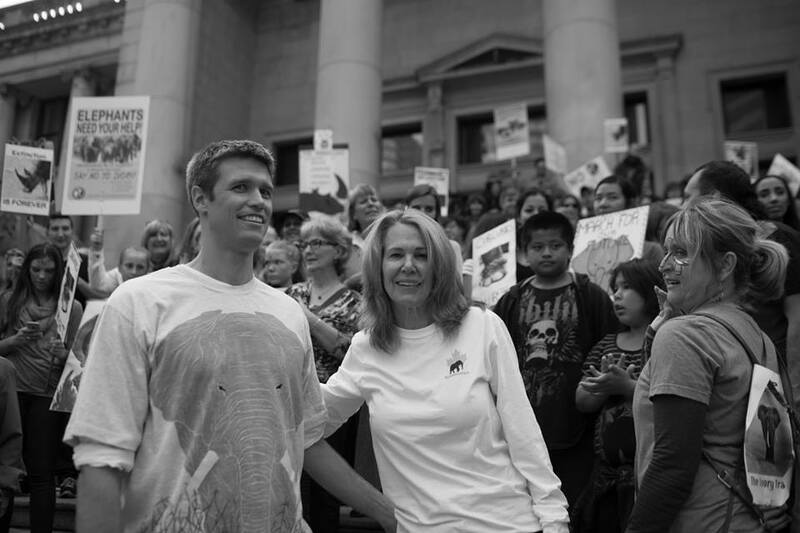 To date, 127 cities across the globe will be marching on that day – this will be the biggest international event ever held to save our planet’s vanishing wildlife, with the focus on elephants and rhinos. We have drummers, face painters, photographers, a fun quiz, and items for sale! We need volunteers the most during this time (beginning at 12:45) to help people register, take photos and sign our petition. 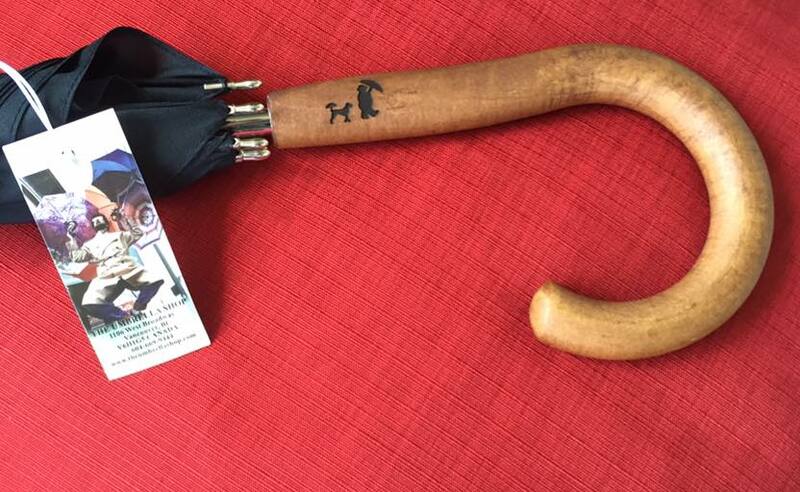 There will be charitable items for sale by donation during this time (cash only). 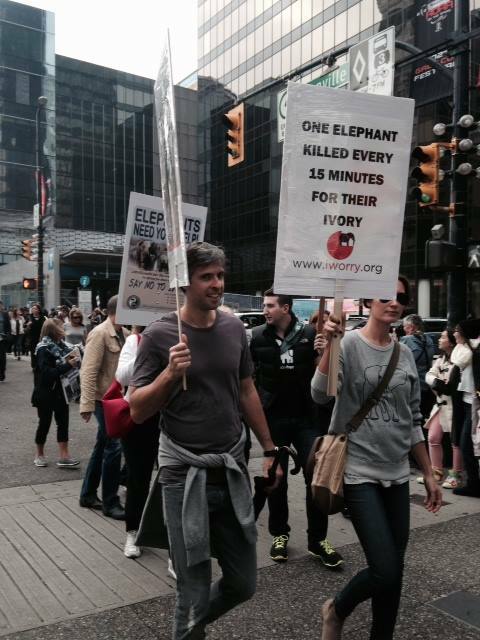 Jake wall is a PhD student at UBC and an African elephant researcher with Save the Elephants. 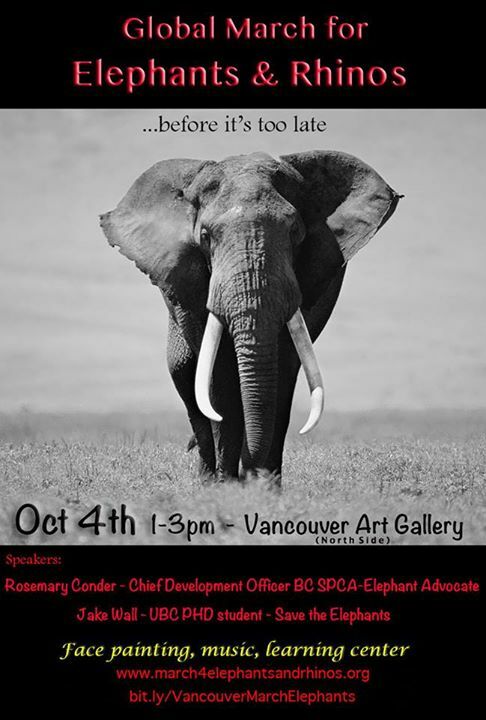 Rosemary is the Chief Development Officer of the BCSPCA and an elephant advocate, with a particular interest in ethical tourism. Closing remarks, learn “What You Can Do”, and more pictures! Here is some artwork you can use or you can make your own! More to come! Marchers in Israel and London! 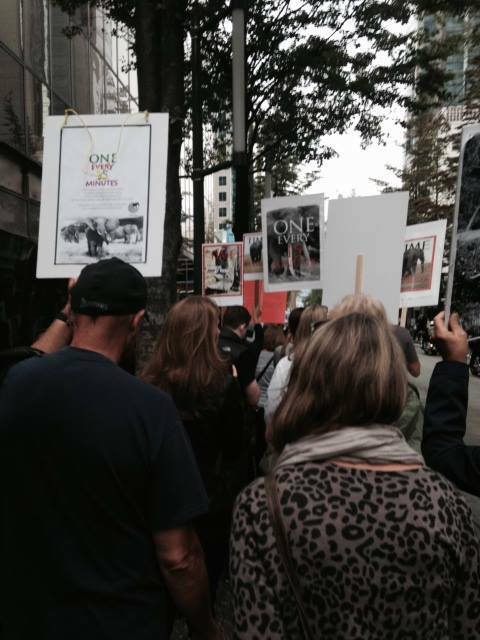 Protest against Canned Lion Hunting in Israel. Please help us get the word out. 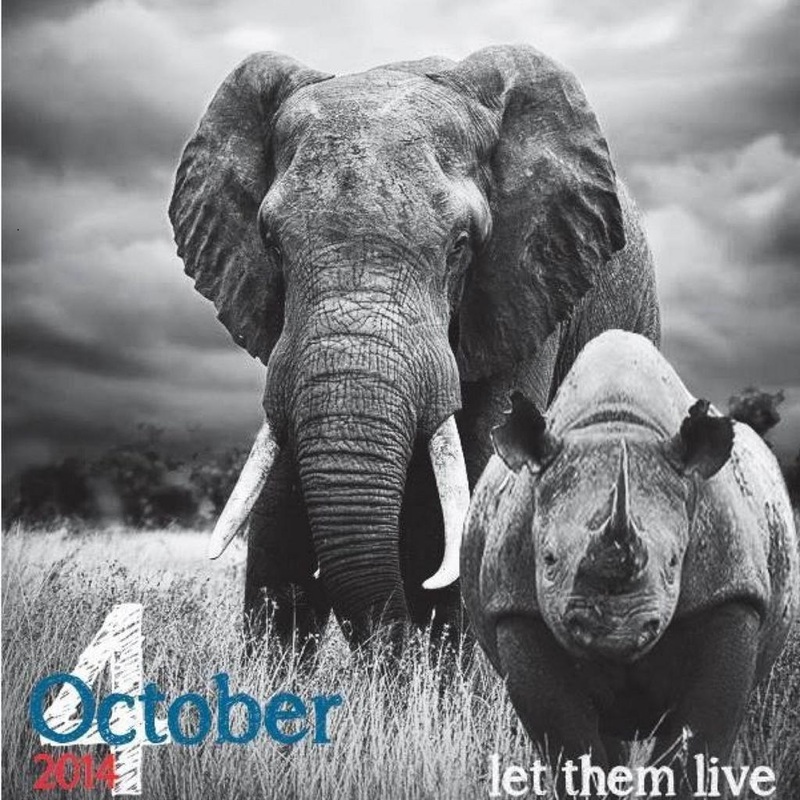 The more people who realize the issues facing these animals, the more of an impact we are able to make on October 4th, the more signatures and MP’s we contact the better the outcome for elephants and rhinos. Let’s make NOISE. Please use this poster to publicize the march. Send it to friends and family, post it at your local library coffee shops. Finalposter – please print or email to your networks. These smaller promo pieces can be used to hand out to your networks. Petitions are the life blood of the march. This is how we really make noise. Getting signatures is important. If you can print a copy of this and get signatures and bring it to the march to hand in to organizers that would be amazing and we’ll love you forever. Petition for parliament-3 – these are signatures to be gathered. Take what you know and let your government rep know. There are more – but these are just a few. Don’t let anyone discourage you from social action. Protest, pushing government and organizations to change works but we need to work together, have fun while getting some serious things done. 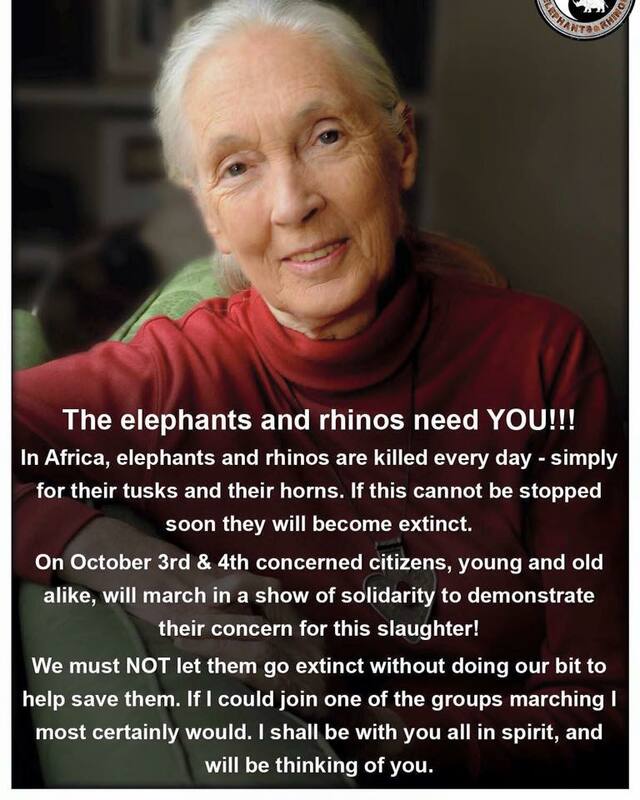 If we don’t do this, these animals can’t save themselves. 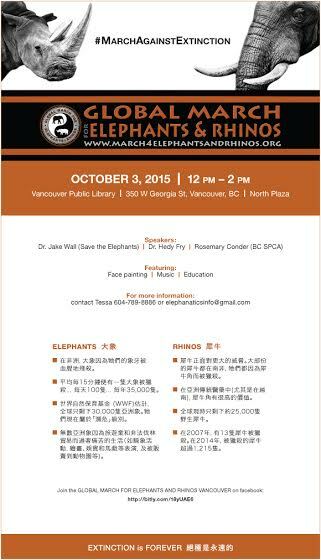 Mrs Helen Clark, head of United Nations Development Program for your support and inspiration in a call to action for support of the Global March for Elephants and Rhinos!!!! 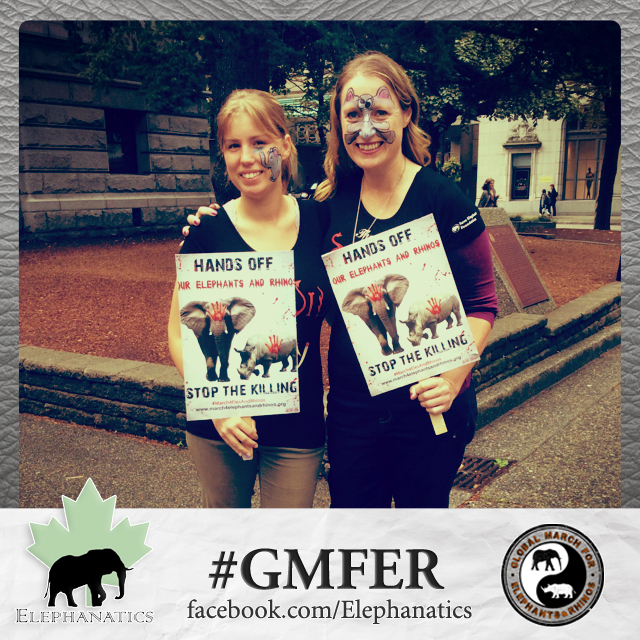 Hello Vancouver Marchers! 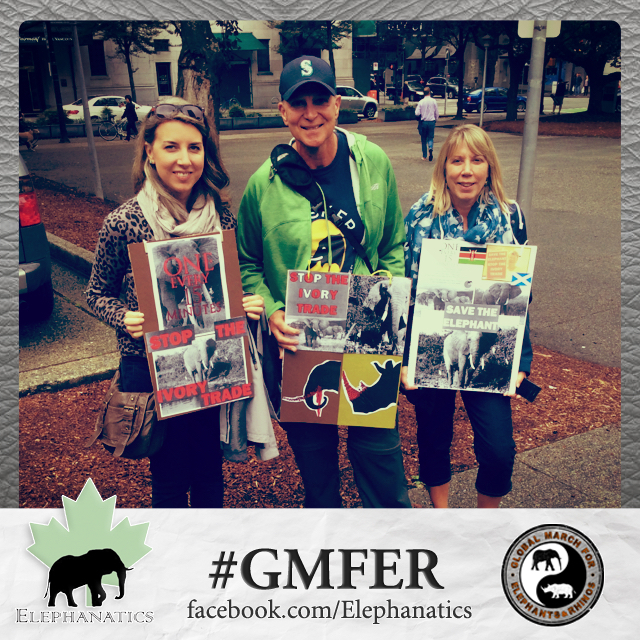 Let’s spread the word far and wide about the upcoming Global March for Elephants and Rhinos in Vancouver! 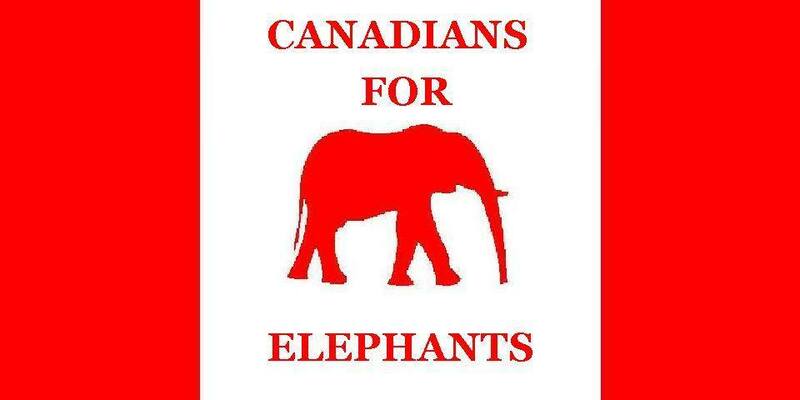 Below are PDF’s of a poster and postcards that you can use to email friends, family, vets, local pet stores, SPCA’s , humane societies, schools, MLA’s, MP’s etc…to get the word out. You can also print the pdf’s and post them at cafe’s, libraries, vet offices etc… They should be printed on 11 x 17 paper. There are also postcard size files available as well. These can be printed double-sided on 8.5 x 11 paper and cut into postcard sizes – easy to carry with you and hand out. There are 117 marches to date in cities all over the world. 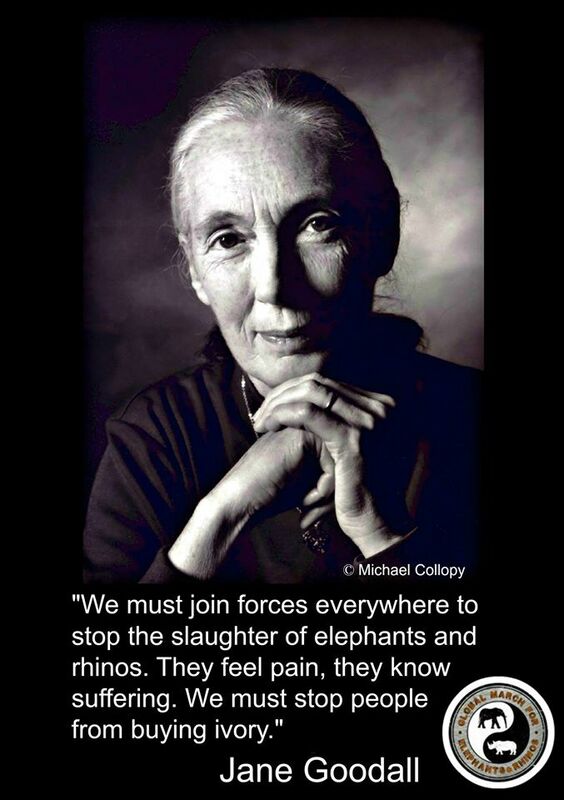 Find one near you and add your voice to help elephants and rhinos at this critical time. 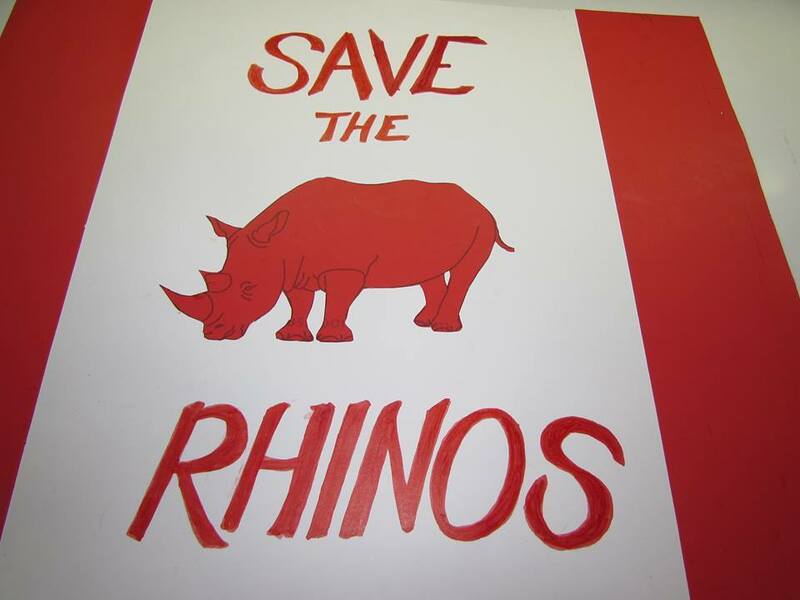 One rhino is killed every 9-11 hours for rhino horn. 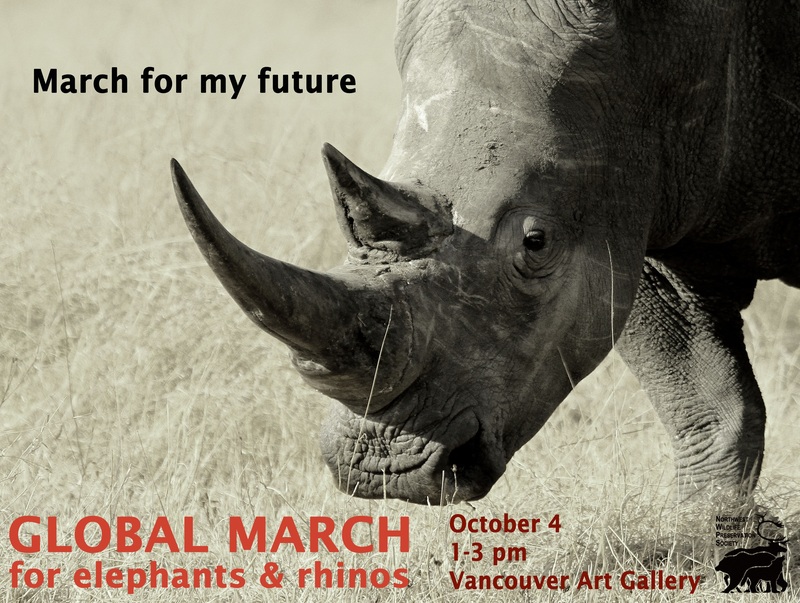 Please join the Global March for Elephants and Rhinos on Oct 4th to call for an end to the killing and a worldwide ban on ivory and rhino horn before it’s too late. 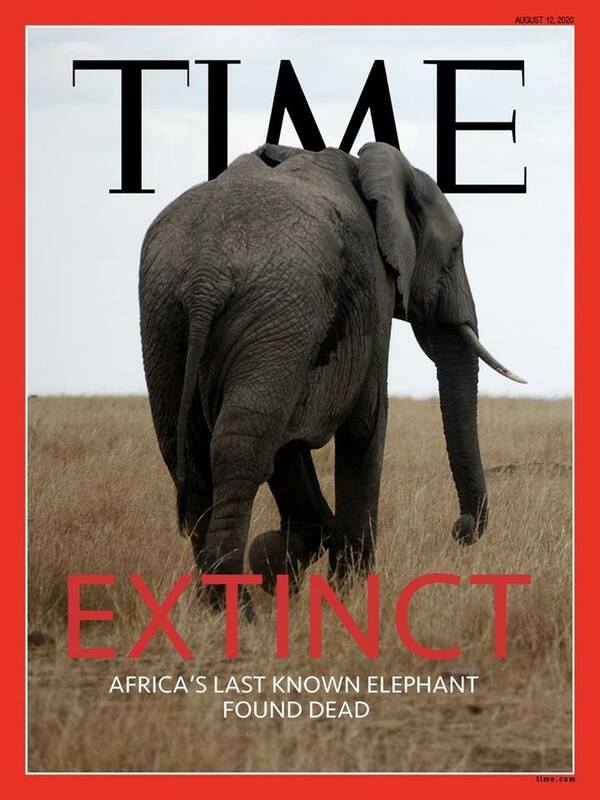 Extinction is forever!